Help us share: A Greener World is possible! We hope your holidays have been full of good company, good food and good cheer. We’re writing to share our new video and ask for your help in spreading the word. While the numerous challenges we face can appear unrelated, many are actually interconnected—and within our power to solve through sustainable agriculture. Please take a few minutes to watch this 3-minute video and share with your friends, family and networks—with your help we can build the movement for A Greener World. If you’d like to share this video, feel free to use the sample social media posts below—or get creative with your own! ﻿Sample Facebook post: Check out the new @CertifiedbyAGreenerWorld video! We know that fixing our food system can seem overwhelming, but we’re up to the challenge! The action steps in this video are a great place to start. @CertifiedbyAGreenerWorld is building a better food system, along with sustainable, @CertifiedbyAGreenerWorld farms everywhere. Learn how you can help build A Greener World in this short video, and thanks for spreading the word! Sample Instagram post: Check out the new @agreenerworldorg video! We know that fixing our food system can seem overwhelming, but we can do this! The action steps in this video are a great place to start. @agreenerworldorg is building a better food system, along with sustainable, @agreenerworldorg farms everywhere. 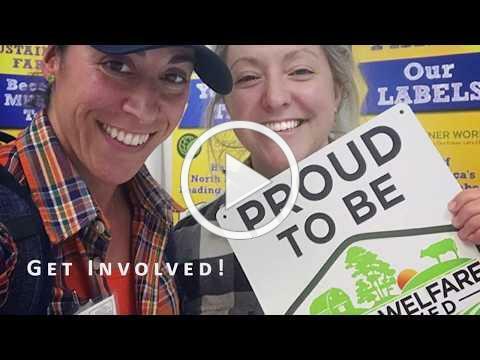 Learn how you can help build A Greener World in this short video, and thanks for spreading the message that A Greener World is possible! Sample Twitter post: Watch the new @CertifiedbyAGW video! We know fixing our food system can feel overwhelming, but the action steps in this video are a great place to start! Learn what you can do to make a change at agreenerworld.org. Thanks for all of your support in 2018. We depend on people like you who know A Greener World is possible, essential, and within our reach. Don’t forget to add us to your address book! Home of North America’s Leading Food Labels. Certified Animal Welfare Approved by A Greener World or A Greener World (AGW) email list. you can do so on the links below.